You know the old saying, "Everything old is new again." The kinds of purchasers interested in electric cars these days — the Toyota Prius, Chevy Volt, and others — echo the sentiments of earlier electric car owners who liked the diminished reliance on gasoline, low cost to operate and maintain, quiet ride, even the "Wow!" factor of being the first in your neighborhood to have one. Near the turn of the twentieth century as motorized vehicles began to replace horse-drawn carriages, lots of start-up auto makers began testing both gasoline-powered and electric engines. In fact, the early electrics (sometimes called "juicers") they tested made numbers of car makers and owners quite happy. The Rauch and Lang Electric was one of the finest, most expensive, and longest lasting of such brands, a car that oozed luxury and was de rigueur for the social set. 1919 Rauch and Lang Electric. Photo courtesy of Hyman, Ltd.
Charles Rauch, son of German-born blacksmith and wheelwright Jacob Rauch, followed in his father's footsteps and opened his own shop in Cleveland, Ohio in 1860. Both father and son had shops in Cleveland along the route of the daily Cincinnati to Cleveland stage coach. When Jacob died in the fighting at Gettysburg, Charles was left to make a go of things on his own. He closed his father's shop, kept his own, and did very well indeed, becoming the largest carriage making concern in northern Ohio by the 1870s. He turned out sleighs, drays, trucks, wagons, and carriages. In 1878, he hired Charles E. J. Lang, a Cleveland bookkeeper, to help him with the financial side of the business. Rauch found Lang's efforts invaluable, and in 1884, partnered with him, incorporating as the Rauch and Lang Carriage Co. An added advantage to the partnership came in capitalization from Lang's wealthy family which was heavily invested in real estate. The plan was to expand distribution and sales nationwide with Rauch serving as president, and Lang as secretary-treasurer, each receiving an annual salary of $1800. By 1890, Lang had moved up to vice president and they had leased a four-story factory for $1650 a year. The carriage establishment prospered as it produced a variety of types of conveyances — opera busses, doctor's wagons, Victorias, Stanhopes, Broughams, etc., each selling from $500 to $2000. In 1903, Rauch & Lang became dealers for the new Buffalo Electric automobile and were taken with its possibilities. Just two years later they were producing their own electric cars, in 1905 rolling out fifty Stanhopes, coupes and depot wagons. And Rauch and Lang were the first — or among the first — to come out with the option of a closed body. In these early days, they outsourced their engines to the Hertner Electric Co., a company they bought out in 1907, learning as many early manufacturers did that there were real advantages in keeping the work in-house. 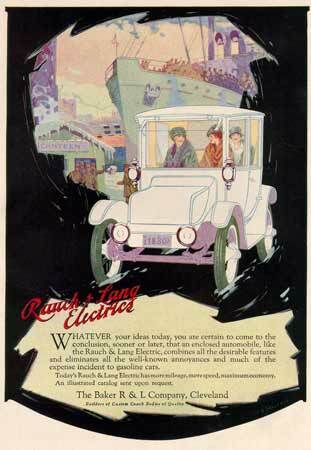 The R. & L. Electrics were the feature of the Chicago and Cleveland Show in Electric Vehicles that year and an ad of the day featured a gentleman's manicured hands holding an oval frame picturing a Rauch & Lang Electric. Its caption read: "For Her: You want the best, and as a Christmas gift a Rauch and Lang Electric should meet with the approval of HER, whatever wife, sister, or sweetheart. Every feature is superior to any other electric vehicle on the market." Ladies were especially appreciative that they didn't have to wrestle with the gasoline engine's noxious fumes or notoriously difficult starter crank. 1907 buyers had a number of styles to interest them. The Stanhope, powered by a 40-cell P.V. Exide battery, was priced at $2250, or, with a folding seat, $50 more. A surrey, with a pressed steel body but without a top, ran $2500 and featured a 2.5 hp Hertner motor. It could achieve a speed of 20 mph and could traverse a distance of fifty miles on a single charge. The Victoria with front seat was priced a little lower, at $2200, and came in blue, green or maroon, with broadcloth upholstery. It also came with side lamps, a tail lamp, storm apron (heavy blanket), odometer, and set of tools. More importantly, that model featured a top made of hand buffed enameled leather. It was powered by a 24-cell battery and could achieve speeds up to 16 mph. A four-passenger coupe sold for $2700 inclusive of extras like a dome light and toilet case. The largest of the models was a six-passenger Depot Wagon weighing 3500 pounds and featuring a double chain drive; cost: $3500. The following year, Rauch & Lang was rolling out 500 vehicles a year with another 300 customers on a waiting list. With that much business at hand, they brought in a mechanical engineer to help them increase capacity. His recommendations led to a number of changes — a $1 million recapitalization, the consequent naming of Charles L.F. Wieber as general manager (he also served as President of Lakewood Realty, the real estate concern involving the Lang family), the construction of a 340,000 square foot factory, and acquisition of an interest in Motz Clincher Tire and Rubber Co. to insure an adequate supply of the 32-inch pneumatic tires used for these vehicles. In 1909, the Rauch & Lang Electric was advertised as the handsomest coupe on the market — "as cozy and luxurious as any woman would have it — as able and efficient as any man would demand it to be." Would-be customers were encouraged to be one of those lucky enough to purchase one of the 1,200 cars made that year in answer to pent-up demand. Upholstery was imported leather or broadcloth in colors to match the exterior. The body was finished expertly, and "the harmony of line and perfection of finish" was meant to appeal to the discerning buyer. Its mechanical and safety advantages were touted, as well: rugged Exide (short for Excellent Oxide) batteries "of enormous capacity"; strong, durable electric brakes; a Corbin key to lock the control handle, meaning "no one [could] steal the car by using a nail or wire". "Other cars may be cheaper at first," the company admitted, "but Rauch & Lang owners spend practically nothing at all for repairs." 1910 was another great year for Rauch & Lang. Their Electrics had become Cleveland's most popular car, in numbers exceeded only by the Baker Electric. They also increased their reliance on advertising markedly, making claims such as these: "The Most Commodious of All Electrics"; "you can travel the whole day without feeling the least fatigue"; "We Are Most Careful of Details". The latter claim was supported by an explanation that three master craftsmen, a body-builder, interior finish artisan, and painter, took three months to finish a car, assuring that "every door and window fits to a nicety, the broadcloth and trimming are placed perfectly, the ceiling is done beautifully, the upholstering is comfortable and the exterior finish is equal to that of the finest pianos made". Ease of operation and safety continued to tilt scales in favor of the Rauch & Lang. They advertised the simplicity of operation, saying it was "accident proof". With the car in neutral, one ad chirped, "It's almost as simple as turning an electric light on and off. You merely push a handle forward when you want to start — pull it back when you want to stop. Pulling it back not only shuts off all power at once, but puts on a strong brake. The car stops almost immediately. You can use the foot-brake, too, if you wish, but it isn't necessary. The steering is nothing more than pushing forward and pulling back on a handle placed directly where the right hand rests naturally and comfortably. It is very easy — not in the least confusing. After one ride you'll have absolute confidence in your own ability to drive the car anywhere and everywhere." In fact, it was so easy to use the company boasted that any woman, no matter how frail, or any child of twelve or older could learn to drive it. In those days speeds were still low and legal motoring requirements were sparse. It wasn't so unusual to see children operating cars on the farm, in the parks, or on the city's highways. Rauch & Lang wasn't all about handsome finishes, either; it paid attention to the mechanical features of the car, as well. Its double chain drive, compound wound motor, and rugged Exide batteries gave a driver good control over the car. Drivers could choose Palmer web Pneumatic or Motz, Rauch & Lang cushion tires to help smooth the ride. All in all, drivers acclaimed the Rauch & Lang Electric the best car made for hilly cities. Of equal importance to many new drivers, the upkeep was minimal. As one advertisement had it, there was no longer a need to depend "upon a chauffeur or a public garage, an electric is the easiest car to keep, in that it requires practically no attention whatever except washing and charging. And any neighborhood handyman is thoroughly capable of that. " In 1911, the Rauch & Lang Electric was proving its mettle nationwide, voted the most popular car that year in San Francisco and Minneapolis. The firm chose to continue its focus on custom quality rather than to compete with manufacturers like Ford that produced less expensive mass-produced cars. Although the Rauch & Lang market share was quite small, there were so many auto makers that competition across the board was fierce. Baker Motor Vehicle Company, the outselling cross-town concern, for instance, sued Rauch & Lang for patent infringements as to how the rear springs were mounted. Despite the competitive spirit, however, manufacturers agreed it might be worthwhile to form an association for the promotion of electric pleasure vehicles. In September 1911, Rauch & Lang was among twelve electric car makers to form the Electric Automobile Manufacturers Association. They hoped to become better acquainted, push for greater recognition at auto shows, and promote sales of electric vehicles. It was about this time, too, that Rauch & Lang introduced the top-mounted, straight type worm drive. In such a drive, the worm (a gear formed like a screw) meshes with a worm gear, increasing torque. It meant a quieter ride, a real plus for electrics. And it also answered a common steering complaint of the time. When a front tire lost air or blew, the front tires pulled the steering mechanism to the side with the flat tire. The worm drive reduced that pull. Of course it also helped that Rauch & Lang were selling good-quality tires that helped prevent the commonplace issue of flat tires. Since 1908 they had held an interest in the Akron-based Motz Tire Company that specifically advertised its tires for electric cars. Their tires, guaranteed for 10,000 miles or two years (nothing approaching the length of today's warranties), offered notched treads to prevent skidding and greater traction. Since the lead batteries powering electric cars were so heavy, those cars could wear right through a solid rubber or pneumatic tire. The Motz cushion rubber tires, however, were longer lasting and provided a softer ride. The mechanical updates were becoming equal to other special touches — satin ceilings; pull-down window shades; a dome light that came on when you opened the door; a cigarette lighter; the new, more powerful Guide Lamps; five forward and three reverse speeds; an electric tail light; etc. 1912 was a really mixed year for Rauch & Lang. Sales were up, the Rauch & Lang Electric was the highest priced car in the country, a significant advertising campaign took hold, and owners were enjoying their lavish cars with "social prestige". Nearly all cars were enclosed models with an upright appearance — a sort of phone booth appearance because there was no radiator and a flat roof. But that same year Ohio inventor Charles F. Kettering invented an electric self-starter for gasoline-powered cars, removing a prime advantage of electrics. 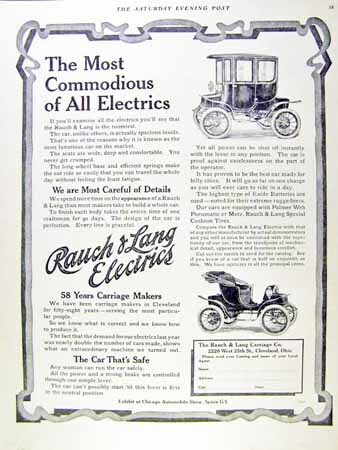 The Rauch & Lang Electrics were selling for about four times the cost of a Model T coupe. In another three years, despite the high price of gasoline, market share for electrics would decline precipitously. Near the end of 1912, Rauch & Lang faced another milestone: its founding father Charles Rauch passed away. The Board of Directors named Charles C. F. Wieber president and general manager, with Charles E. J. Lang as vice-president and treasurer. At the start of the year, however, none of these changes was in evidence. 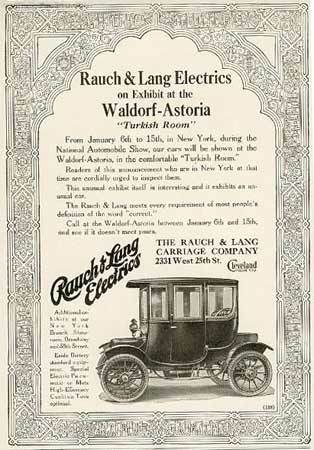 The Rauch & Lang Electrics, now listing for upwards of $3000, were on view January 6-15 at the Turkish Room of the Waldorf-Astoria as part of the national auto show. They were said to meet "every requirement of most people's definition of the word 'correct'." The car was advertised to go up to 18 or even 20 miles an hour by means of five forward speeds operated by a tiller and a sixth passing speed controlled by a floor button. Further, Rauch & Lang began hailing its electric as the safest electric on the road. Just by pulling the lever back, any man, woman, or child could shut off the power, slow the car, and apply a powerful brake. It took little time for the car to come to a complete stop. Power could also be shut off instantly by depressing a metal ring. The car could only be restarted from the neutral position. There were both hand and foot brakes that could be applied, as well. Because the control handle locked with a Yale key, the car was hailed as "theft-proof" — and the control lever was said to make the car "fool proof" and "accident-proof". A dramatic advertising campaign which ran for several years focused on the years of carriage building experience Rauch & Lang offered. The lower portion of a 1912 ad illustrated the royal Stage Coach of Cosimo, Third Duke de Medici, and noted that Rauch & Lang had been building fine coaches over sixty years. This was the ad copy accompanying that illustration and another illustration of the Rauch & Lang brougham: There is a quality in every detail of the famous Rauch & Lang Electric which is apparent at once to people accustomed to high standards. These cars are built as staunchly and as ably as the famous royal coaches of history which have been handed down from generation to generation. But the mere expenditure of money for first-class material is not sufficient to produce the Rauch & Lang standard. We have been coach, brougham, carriage builders since 1853 — we have practiced the attainment of the highest standards in style and finish for more than 60 years. Rauch & Lang cars are built for people of unquestioned taste and sound judgment — therefore, the appearance and performance of these electrics must not be left open to earn the slightest criticism. The acknowledged high standard of owners has stamped it the "Car of Social Prestige." And prestigious it must have been. 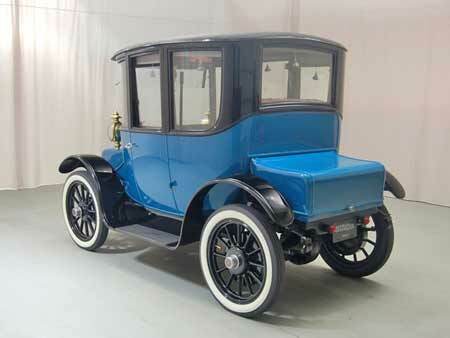 The John W. Rich Automobile Museum displays a 1912 Rauch & Lang town car owned by none other than Thomas A. Edison. The same ad campaign continued into 1913, now with illustrations of the Royal Coach of Empress Catherine of Russia, the State Barge of the Wife of the Doge of Venice; the Wedding Coach of Napoleon I; or the Royal Coach of Louis XIV of France. Royal quality was still available to the consumer wealthy enough to pay for it. Distinguished from the ordinary factory electric of the day, these cars could not be rushed. Limited production numbers assured continued quality ("exactly the correct touch" in "every detail of construction and finish") and exclusive ownership. 1913 brought with it other mechanical innovations, too. Rauch & Lang introduced the bevel gear transmission and the dual control coach that enabled a driver to steer from the front seat, the back seat, or both positions (selective dual). The front seat revolved so a front-seat passenger could face the driver if s/he chose to drive from the rear. The car for royalty campaign was still going strong in 1914, now comparing the Rauch & Lang to the Chariot of Pompeia, wife of Julius Caesar or the Royal Sleigh of Princess Louisa of Prussia. Besides the royal treatment, Rauch & Lang laid claim to high art standards, setting fashion in the automotive world, and promised: "All the mileage you can use in a day — as fast as the law allows." The Smithsonian now owns a 1914 Rauch & Lang formerly owned by the Army's Surgeon General. It's a four-passenger brougham with plum-colored upholstery. During the 1952 Presidential campaign, then-candidate Eisenhower turned a few heads by driving his wife's parents 1914 Rauch & Lang, with swivel seat, removable brass clock, and crystal bud vase. The 1915 Rauch & Langs were advertised as "Strikingly Beautiful — Mechanically Perfect". Still, nationwide sales of electrics were down. So, setting aside bad feelings surrounding the earlier patent suit, Rauch & Lang merged with Baker Electric in the summer of 1915. The new company was the Baker R. & L. Company, capitalized at $2.5 million. Charles C. F. Wieber served as president with F. R. White (Baker's vice president) serving as first vice-president and Charles E. J. Lang as second vice-president. That year a roadster listed at $2600, while a limousine went for $4000. Distance driving was becoming possible, as well, with cars going from 50-100 miles per charge at a steady speed of 20 mph. 1916 advertisements have featured both Baker and Rauch & Lang logos along with one-word attributes to appeal to undecided buyers, attributes like comfort and confidence — comfort in body and mind and confidence in the car's mechanics and safety attributes. In one such ad, a four-color, head-on snowy scene depicted a woman driving in a short fur cape and feathered hat with her two children in winter coats and hats sitting beside her. It read, "The mother finds comfort in knowing that the safety and pleasure of her little ones are enhanced because of this driving simplicity - this independence from mechanical obsession and confusion." Other ads of the time also hit upon the car's discrete virtues. One depicted "pleasure" in a summer scene with a mother in a full, white, frilly dress gathering flowers in a meadow as one of her children played with a doll and a second bent over to smell the flowers. The ad text ran, "Your Rauch & Lang or Baker Electric is a car of Pleasure. You find pleasure in the utility by which you so easily reach the out-o'-way places or make a social call." Another cited "Indispensable" as the watch word: "Sojourners in Florida and California are the fortunate ones who send on their Rauch & Lang Electric to multiply the pleasures of their season of change." Noted illustrator C. Everett Johnson drew several ads for Rauch & Lang in 1917. One depicted a brown Rauch & Lang outside and an interior scene with an ornate wall sconce, a fur-lined opera cloak and lady's purse lying on a richly brocaded chair, with fur-lined boots alongside it. On a side table rests a gentleman's top hat and gloves. The copy was short and direct: "Prestige. 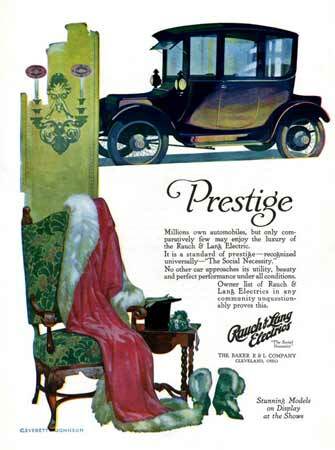 Millions own automobiles, but only comparatively few may enjoy the luxury of the Rauch & Lang electric. It is a standard of prestige — recognized universally — The Social Necessity." Another illustration was a snow scene with a blue Rauch & Lang Electric near a stone bench that ended in a large stone urn holding an evergreen shrub. On the bench are red ice skates, a red drawstring bag, crossed ice hockey sticks, and a black and white striped scarf. This time quality is the featured trait: "Quality buyers have always selected the Rauch & Lang as a matter of course. . . It is a luxurious treasure — beautiful, simple, dependable, silent and safe." Another ad that year showed the front porch of a home with pet dog, traveling trunk, and hat box and highlighted the Rauch & Lang's distinction: "Sub-consciously every fortunate owner of a Rauch & Lang Electric realizes its many distinctive qualities. But the delights of Rauch & Lang beauty, luxuriousness in equipment, safety, and dependability of performance under all conditions, are constantly in mind." While Baker Rauch & Lang was the company name at the bottom of the ad, Baker's logo no longer appeared since all cars now produced were being marketed as Rauch & Langs. The ads were shiny and optimistic and the merger between Baker and Rauch & Lang had made it the world's largest electric car concern. While there were hopes that in playing to the strengths of the two concerns and streamlining operations, the company might prosper, one unsettling truth remained: Gas-powered cars clearly had the lead. Since the 1915 merger, aware of that uncomfortable fact, the new company had begun to focus on the Owen Magnetic, a concern they took over late that year. The six-cylinder car ran on a gasoline engine but featured an automatic transmission — no more of the difficult gear shifting that had beset early motorists. The engine turned the magnetic field, the magnetic field turned the generator, and the generator turned the rear wheels. The body was built at the former Rauch & Lang plant, the drive train at the former Baker plant. List prices ranged from $3100 to $5700 and styling rivaled the Daimler and Mercedes of that time. The General Electric Company was interested in the Owen and contributed $2.5 million to the concern. Owen Magnetic owners were seen as a class apart from the average driver. As one ad had it, "Those who are distinguished for their Owen Magnetic Motor Cars are strict individualists though not bizarre. Their town and country houses, their gardens, all their possessions are far from the commonplace. And so when it comes to a car, they insist on getting away from the monotonous. Up and down the Avenue, or at the Opera, or at the Country Club — wherever the world of fashion congregates — certain cars distinguish the vivid personalities from the drab. Each Owen Magnetic expresses this idea of unobtrusive elegance. Exterior and interior colors and upholstering are decided upon by the owner. All the appointments show careful selection — such as the silver hardware, the lighting fixtures, the carpeting. The most casual observer knows instantly that the owner is a person of faultless taste. Just as the Owen banishes the commonplace in appearance, so does it eliminate the mechanical crudities of yesteryear. At the push of finger-tip this great car is in complete control — giant power leaps across air space from engine to wheels. No gear shifting — no clanking noises — no jerks nor lunges — just a quiet, floating sensation, entirely different!" The car was popular and things were looking good — that is, until the War Department came calling in 1917. They needed both steel and electric components to wage WWI so production of the Owen ground to a halt. Instead the firm began building electric tractors, heavy-duty trucks, bomb-handling equipment, etc. At the end of WWI some of these trucks and tractors were marketed, eventually becoming the concern's most popular product. While the Owen Magnetic may have been the hope for the future, the firm continued to build Rauch & Lang Electrics in a variety of body styles (including a relatively rare 4-door model). By 1919, enclosed electrics were the most popular electrics and Rauch & Lang was styling itself progressive, "unlike old-time electrics", with more speed, greater mileage, and maximum economy. The cars were as handsome as ever — with wood spoke wheels and whitewall tires, brass lamps, and shiny black fenders setting off the main body color. Rauch and Lang ad welcoming WWI soldiers home. That year, following founder Charles E. J. Lang's departure to open his own Lang Body Co., the company decided to diversify a bit. It established the Raulang Body Division to build bodies for other manufacturers. Over time, Baker Rauch & Lang built bodies for Cadillac, Packard, Peerless, Dusenberg, and others. They also built bus bodies for White, General Motors, Yellow Coach, Reo, etc. Products were popularly marketed as Raulang or Baker-Raulang, although the name was not changed legally until 1937. Ads for 1919 featured both Rauch & Lang Electrics and Raulang Electrics, each with a black background wiped away to disclose an active scene with a lightly colored Rauch & Lang Electric in the foreground. One showed three stylish women dressed in winter coats and hats in their Rauch & Lang as they departed from welcoming soldiers home from the war. Titled "An Inevitable Decision", the text claimed, "No car is handsomer. Nor more comfortable." Another ad featured a logo for Raulang Electrics and led with this line: "More Men Now Prefer the Raulang!" Two men dressed in suits and ties and wearing felt fedoras reviewed housing plans as they drove away from a housing development. "The Raulang is truly an all-family, all-hour, all-performance automobile," the text read in part. At the start of 1920, Raymond S. Deering of the Stevens-Duryea Company bought out the "Raulang" electric car business, reorganized it as Rauch & Lang, Inc., and moved production to Chicopee Falls, Massachusetts. 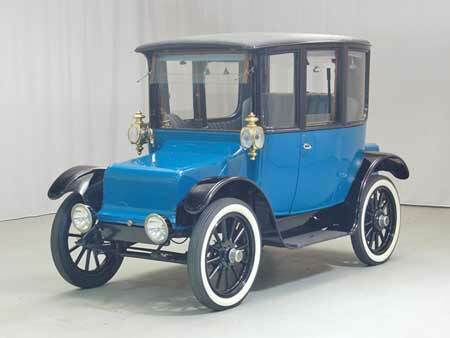 With available capacity in a newly constructed facility, Stevens-Duryea centered its attention on producing both gasoline-powered and electric taxicabs. In the early twenties, the gasoline taxicabs sold much better than the electric versions — but electric cars were still available for family purchasers, as well. The Automobile Journal of May 1921 noted that to keep one of these family cars charged the average electric bill came to less than six dollars a month and that while 175,000 cars had been stolen the year before, not a one of them was a Rauch & Lang. 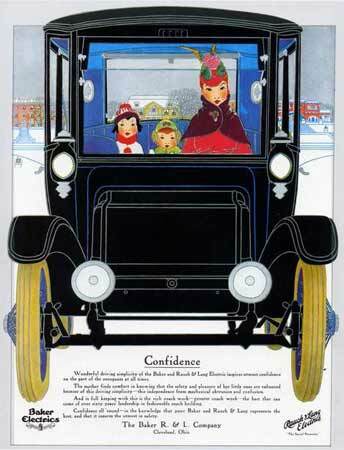 A text-heavy ad that appeared in Country Life for May, 1923, touted the Rauch & Lang Electric as a great family car: "Easily Operated, Economical and Dependable. Electricity to-day dominates the world as the perfect driving power. . . . Enlisted to drive giant battleships, chosen to drive great railway trains, called on the job where there is any big work to do, it obviously is the practical power to drive automobiles. . . . What the Rauch & Lang electric Automobile gives you is the service you need day in and day out — the perfection of service in driving in crowded traffic, over streets rough or smooth — quick starting — quick stopping, — and above all, economy of operation and maintenance.... Built around electricity — the driving power which scientists and engineers alike agree is ideal — the Rauch & Lang Electric Automobile delights the scientific mind and practical hand. It possesses more what automobile engineers and all striving for, no matter what type of car they build — even, continuous torque without gaps of power, impacts and impulses, noise and vibration . . . powerful, noiseless, free from vibrations, sturdy with few parts to get out of order, and friction reduced to a minimum. It is clean, roomy, comfortable — the ideal family car. The battery is re-charged at night when the car is not in use — as simple as connecting an electric iron. Power costs you on [sic] an average of $5.00 to $10.00 per month. And here is the supreme economy — the owner of the Rauch & Lang electric automobile needs no chauffeur. . . . It climbs hills with an ease unmatched by many cars and climbs them without splutter, jolt and jar. You cannot know perfect motoring until you have driven in a Rauch & Lang Electric automobile." By 1924, however, sales had hit rock bottom and the company was in serious financial trouble over delinquent tax assessments. The company limped along for a short while before it went into receivership. Raymond M. Owen, former builder of the Owen Magnetic, bought the concern for $450,000 and made Robert W. Stanley head of Rauch & Lang Inc. He manufactured a few more cars but the sales just weren't there. In the summer of 1928, half of the Rauch & Lang plant was leased to the Moth Aircraft Corporation — and car production ceased. There was still one last, weak gasp left for Rauch & Lang, though. Just before the stock market crash of October, 1929, in collaboration with General Electric they began work on an experimental car with an electronic automatic transmission. How they happened to be working on that prototype is a story unto itself — and it begins with Hetty Green, known as the Witch of Wall Street. Hetty was born in 1834 and as a young woman inherited millions of dollars of family money. In 1867, she married into a wealthy Vermont family and had two children, son Edward H. "Ned" Robinson and daughter Sylvia. Hetty invested wisely and increased her fortune markedly. Her eccentricities, however, were just as notable as her wealth. At this late date it's impossible to separate fact from fiction but stories abound as to Hetty's stinginess, claiming she never turned on the heat, wore a single change of clothes until they just about fell off, rode an old carriage, ate cheap food, etc. When son Ned was ten years old he broke his leg sledding. Hetty's failure to get him immediate medical attention led to the need for amputation of the limb. At Hetty's death in 1916, her children were left with nearly $200 million to manage and they were more "normal" as to how they spent it. Ned was a collector and investor and held a majority interest in General Electric. As he looked for additional investments, GE's board of directors introduced him to Raymond M. Owen, a gentleman they knew from their earlier interest in the Owen Magnetic. "Ned" Robinson, with his one million dollar investment, and Owen began with a 1929 Stearns-Knight cabriolet roadster that GE engineers helped convert to electric drive. The result was a 60 hp gas-electric. GE announced its readiness to begin production but as the country's financial woes worsened, plans to proceed were shelved. The depression had hit too hard and lasted too long for the firm ever to regain its footing. In 1932, it folded. From building elegant carriages to experimenting with one of the earliest gas-electric combinations, Rauch & Lang appealed to wealthy, fashionable patrons. In combining fine craftsmanship for the body and finishes with continuous mechanical improvements they offered prestigious cars for "perfect motoring". While one of the longest-lasting electric cars, the Rauch & Lang Electric was no match for far less expensive, mass-produced gasoline-powered cars.